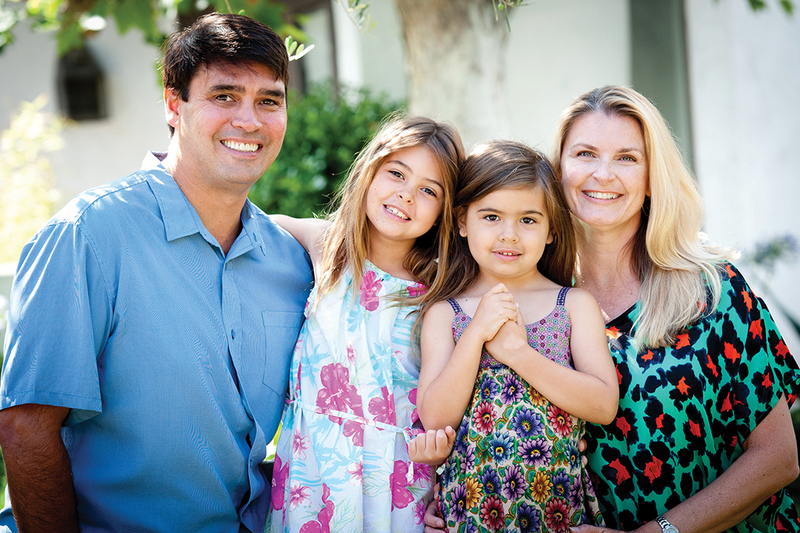 When his wife Jennifer was pregnant with their first child, Michael Solum wanted to return to his hometown of Pacific Palisades to raise their children. Part of this change involved switching career paths, and a friend from his days on the USC football team suggested opening a Farmers Insurance agency. This would be a shift from his work in sports marketing, but the idea took root. Solum, then a Venice resident, enrolled in a Farmers Insurance program that taught about the company’s products. In 2009, three months after his daughter Sierra, now 7, was born, he opened his agency at 881 Alma Real. A second daughter, Kaia, 5, joined the family two years later, and both are now enrolled at his childhood school, Corpus Christi. Solum, who grew up on Toyopa with his parents Conrad and Alli and his three sisters Lori, Kami and Kathy, has also enjoyed giving back to his hometown by sponsoring the Corpus Christi golf tournament and providing water for the 10K race, of which Farmers Insurance is now an official sponsor. Farmers is his agency’s main insurance provider, but Solum also offers varied insurance products from Blue Cross/Blue Shield, Aetna and other insurance companies. His business has two agents and five employees in total, including Shannon Winters, who also grew up in the Palisades. The company provides all types of coverage, including home, health, auto, life and small business. His niece Meghan, 22 (daughter of his sister Lori Middleton, who also lives in the Palisades), assists with on- line marketing and also bakes cookies for the holiday baskets the company sometimes sends to local real estate agents, mortgage brokers and escrow agents. The real estate industry brings him a good portion of his business through referrals for homeowners’ policies, Solum said. His local expertise has made him particularly capable with helping people who need insurance in high fire danger areas, where coverage is sometimes hard to find. Part of that service involves providing clients with annual reviews to make sure they don’t need to alter their polices when their circumstances change, either from adding assets or downsizing. “People buy insurance and forget it, but if you haven’t updated in 30 years, there’s a problem,” Solum noted. He also offers the same service for potential clients. For example, he said a friend’s mother recently came to him after her husband died so that Solum could assess her policy coverage. Everything looked good, so he suggested that she retain her current coverage. At other times, more insurance is needed.